Not sure if you recall but I wandered off to the thrift store a few weeks back and got some really cheap maternity clothes there. I was super excited. That was, until I put on my lovely heathery purple shirt to find out that it was like wearing a sack. A very over sized, shapeless sack that made me look frumpy and like I had no differentiation between my chest and my belly bump. That simply would not do.So, in between working (or not working) on other projects I have been modifying this shirt to my liking. There really was nothing special about the shirt. It was a wide boat like neckline with gathered cap sleeves and a keyhole on the back. I really think it was the color that made me get it. It was purple. I love purple. It follows me home in every way, shape and form. But this purple shirt was wrong. Wrong, wrong, wrong. What I envisioned was something with a nice trim, some details on the front, and some sort of empire waist. So I went to work. The first step was to cut the neckline into a slight v and cut off the sleeves. 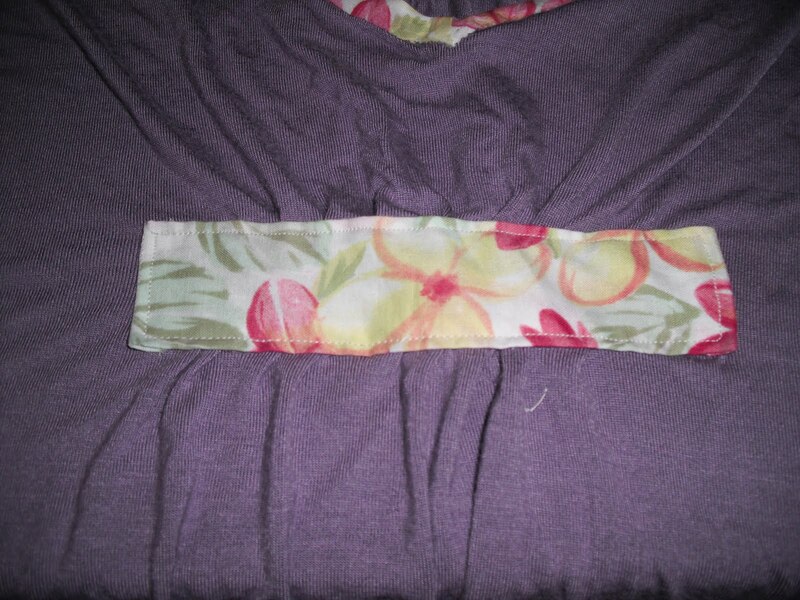 Next, I made a bias binding of this lovely floral print that I never had enough fabric for a full shirt with. 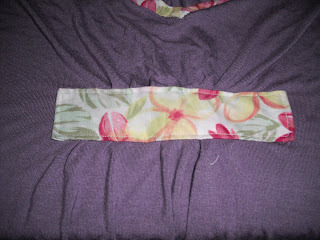 Then I made 3 rows of gathering stitches at the center of front right under the bust to give myself a waist. When I was sewing the binding onto the neckline I found another 'fun' thing about this shirt. 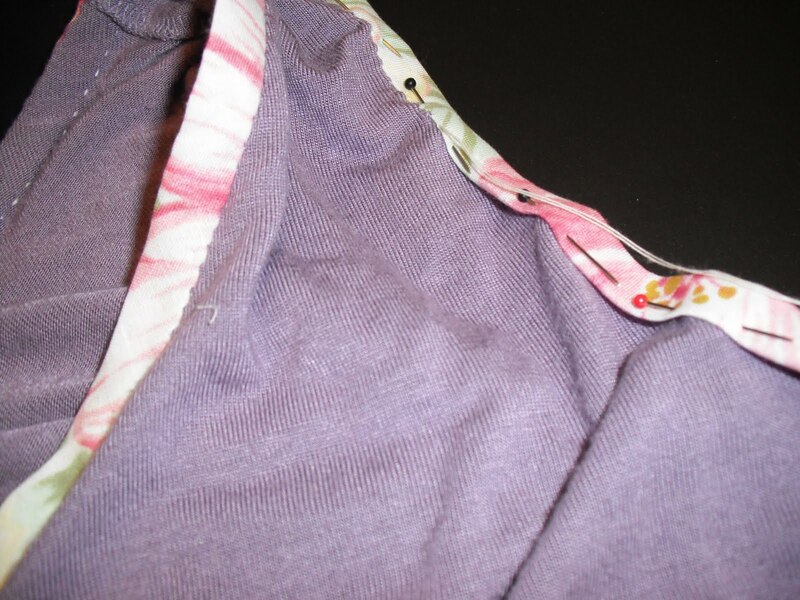 This shirt was really stretchy, and liked to snag at any attempt at using a seam ripper. Lovely. The solution has been to stitch the other side of the binding closed by hand. 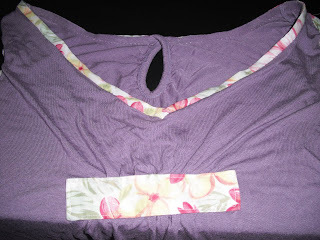 After I did that to the neckline I took a break and worked on that gathered center section. 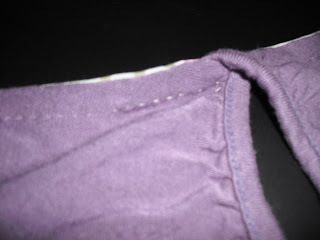 Here you can see the hand stitching of the bias I had to do. Stupid knit. 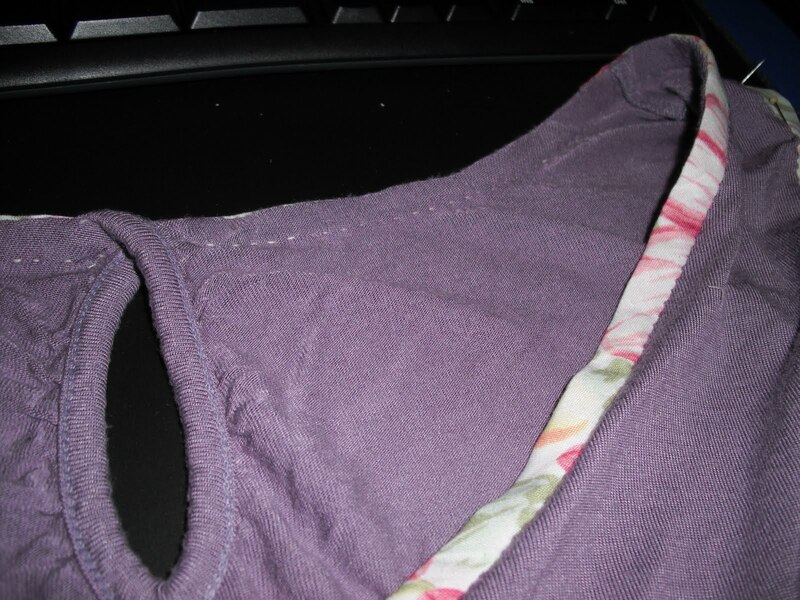 I cut two rectangles of fabric in that same floral and sewed them together near the edge (probably could have just used interfacing on one). Then I pressed the rectangle under 1/4 inch on each side and tacked it onto the gathered section. Finally, I sewed the rectangle down. It gives it a nice center detail and I think it ties in nicely with the trim. After I am done with sewing the binding around the armholes I will have to make my final decision as to how to decorate it. I am not sure if I want a cluster of flowers going from the shoulder, flowers on the center section, rows of ruffles, or some ruffles down the shoulder. Either way, it will be a vast improvement. I'm happy with how it's turning out but I really wish I didn't need fixed in the first place. Oh well, that's what you get for spending $1.50 on a top. Can't win all the time.